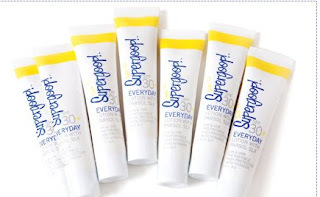 This online store supergoop sells lip balms, sunscreen sticks, lotions, and wipes. What I received to review were the Supergoop lip balms in Acai Fusion and Mint Fusion. The key ingredients in these items are Parsol 1789 and Parsol slx, Octinoxate, Shea Butter, and Vitamins E and C the Benefits it provides are protection from long wave length Uva rays Provides deep Hydration rich extracts to protect from free radicals triggered by sunlight, tabacco, and smog encourages cell renewal. The super berry acai hydrates lips, fights free radicals, and helps repair oxidation damage. The cooling spearmint leaf oil boosts energy and freshens breath while menthol cools and soothes stressed out lips. These lip balms are great from someone who has dry lips all the time and there always peeling these lip balms make the feel great. They kinda remind me of the beach because they kinda smell like sunscreen that may be the only down fall for some people but I don't mind it they feel great on the lips. If you would like to get your own check out the site http://www.supergoop.com/ also sold at Sephora.